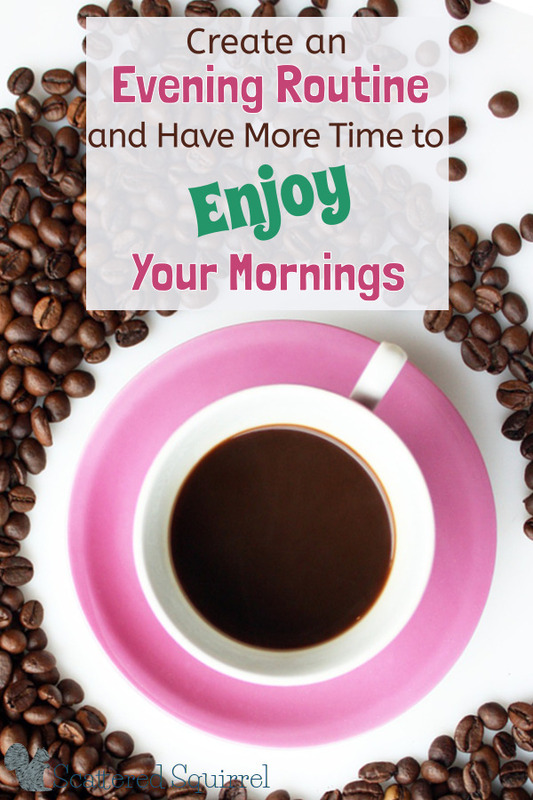 Morning and Evening routines are like love and marriage – you can’t have one without the other! While many of the routines we create for ourselves tend to work in tandem with other routines, feeding into one another to keep our days running smoothly, morning and evening routines take this to a whole new level. They have an almost symbiotic relationship and need one another in order to work well. Today I’m going to show you how to use that relationship to your advantage and create an evening routine that not only works for you and your family but makes for much smoother, less hectic mornings. Who’s with me? Now I know this is very much a chicken and egg sort of situation. Which comes first? The morning or evening? The choice is really up to each individual, but I firmly believe that a great morning starts the night before. By my own admission, I’m not a morning person. I don’t want to have to put too much thought or extra effort into getting us out the door on time. Instead, I put a lot of thought, time, and effort into creating a solid morning routine that will work with my foggy brain, rather than against it. Part of that routine is planning for our mornings the night before. Make your systems work for you, not the other way around! 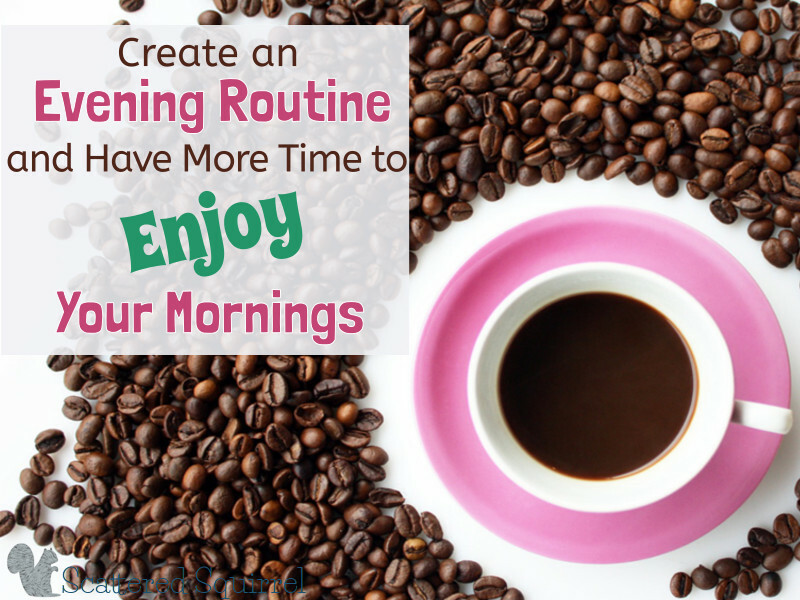 Here’s how I figured out how to create an evening routine that makes our mornings rock! A solid evening routine has many benefits. It helps to keep that chaotic Mad Dash to Bedtime under some semblance of control. It helps make for smoother bedtimes for the kids and let face it, for ourselves too. And it helps us rock our morning routine. When I started thinking about how to create our evening routine, I did what I usually do in situations like this …. I made a printable. I often do this at times when I’m trying to puzzle out a time management challenge. I’ll start creating a printable to help me figure it out. In this case, creating the printable allowed me to find a really simple solution to this challenge. Creating an evening routine begins where any other routine building begins, by figuring out what you need to do. 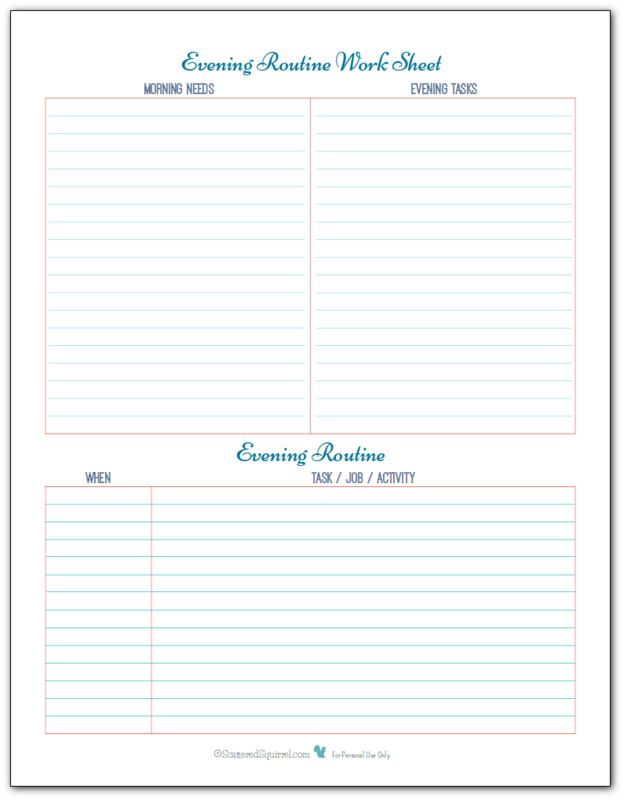 Grab a copy of the printable, or just use a blank sheet of paper divided in half. Start by jotting down what you need to get yourself and/or your family out the door each morning. Anything you and your family need for a successful morning routine. 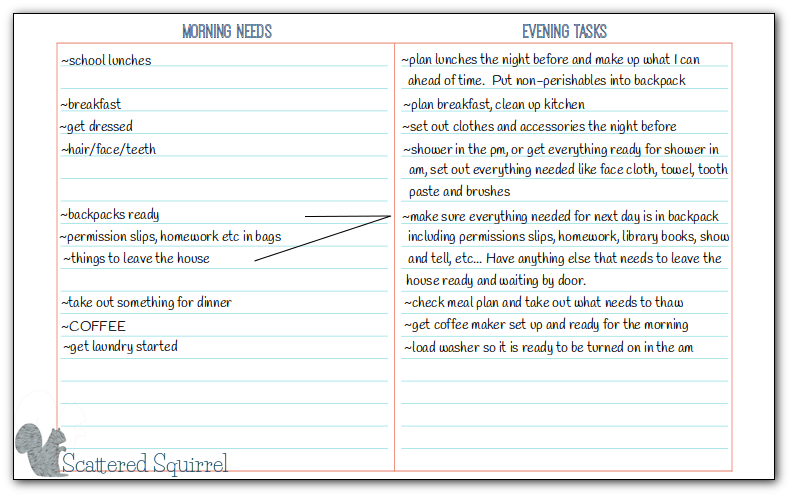 On the other side of the page jot down things you could do in the evening to help make those morning items easier. If you make your own lunches, is there anything you can do the night before to help make packing those lunches in the morning easier? Maybe your kiddo has a hard time deciding what to wear in the morning, perhaps you could have them choose their clothes the night before. Completed homework could go straight into backpacks when it’s done, rather than sitting on the table until morning. In the picture below you can see how I did this for our family. Remember, it doesn’t have to be complicated, the idea is to simplify things! This step might take a little more thinking, but again, please try to keep it simple. The last thing you need in your evenings is to add complicated tasks. Evenings are busy enough. 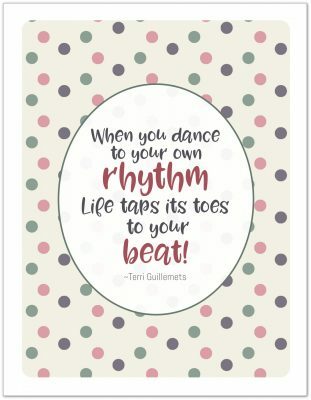 My approach to this was to think about the rhythm to our afternoons and evenings. I tried to weave the tasks from step 1 into areas where they sort of naturally fit. The more natural a task fits in with your current flow, the easier it is to make it part of your routine. In our family, afternoons and evenings are set up into various chunks of time. In the image below, you can see how I tried to match these news tasks to our existing flow. 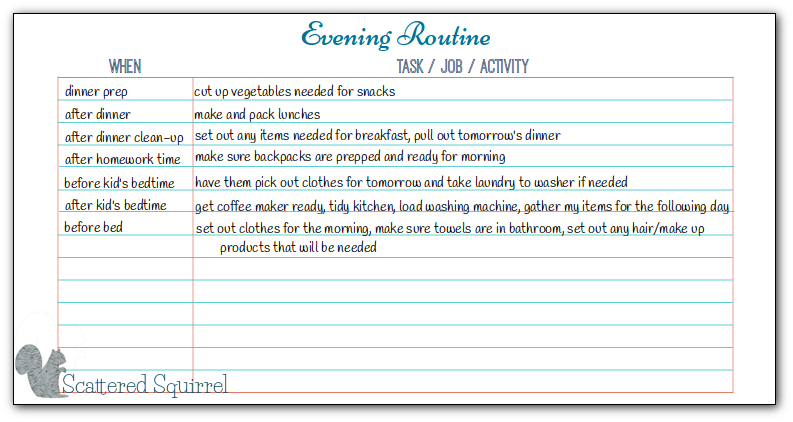 Try to think about how you can match the new to-do items with things you already do each evening. Such as cutting veggies for tomorrow’s snack during dinner prep. You already have the knife and cutting board out, why not quickly wash and slice some celery and carrots right then? It takes two minutes. Also, try to make sure you’re not making more work for yourself. Instead of cleaning up from dinner then making lunches and having more to clean up -make the lunches before dinner clean up. That way you only have to worry about dishes once. Whenever I make changes to our routines, I like to make one change at a time. So I pick the one that will have the most impact and start with that. For our evening routine, I started with making lunches. I focused on making sure I was making lunches each night for a whole week. Then I added another task into our routine. I repeated that process until each new task was added into my evening routines. Don’t try to make all the changes at one time! The worst thing you can do when creating a new routine is to try to do it all at once. Trying to do too many new things all at once can cause more grief than it is worth. A routine is a tool, and like all tools, how it is crafted is just as important as the job that it does. Rushing the creation process only creates more work in future. Take your time, and just keep moving forward step by step. Before you know it you’ll be doing your tasks without even thinking about it. A little bit of effort in the evenings means I get to enjoy my coffee in the morning while being more present with my boys. Rather rushing through wake-up time to out-the-door time, I have chat-with-me time or second-cup-of-coffee time. <—heaven! Sure it took a little bit of work in the beginning, but the end results made it worth the effort. But don’t take my word for it, give it a try for yourself and see if it works as well for you and your family as it has for mine. As always, to grab a copy of this printables for yourself, simply click the picture of it. And don’t forget, if you’d like them customized to suit your tastes or needs better you can hop on over to the Customized Printables page and send in an order. Until next time I hope you all are having a wonderful week! Do you have an evening routine? Does it help support morning routine? Or vice versa perhaps? This is GENIUS! We do make packed lunches the night before to save time in the morning, but I never thought to write down all of our morning tasks and then look to see which could be moved or aided by doing something the night before! I’m not a morning person, so the less I have to do in the morning. 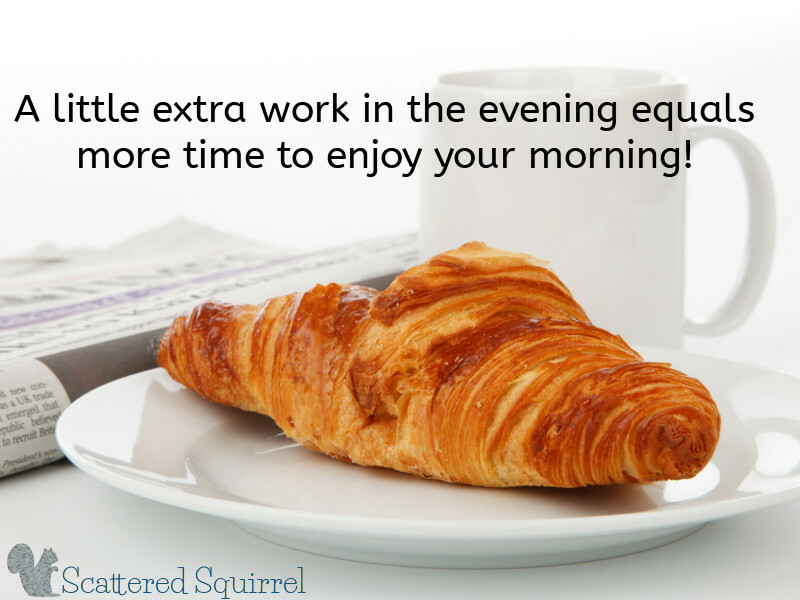 It wasn’t until recently when we had some very busy evenings that I noticed how much extra time mornings take when I don’t get to my evening stuff. I’d rather add a few things onto my to-do list the night before than be stuck rushing in the morning.